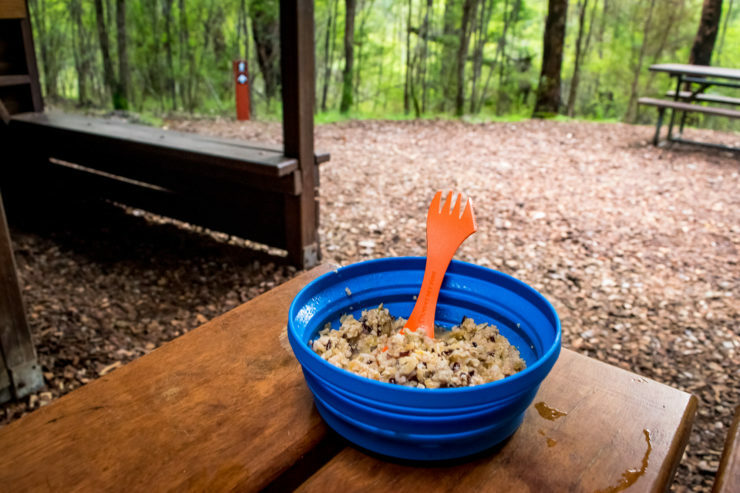 Eating out on the trail doesn’t have to be a dull affair due to the weight and size limits of carrying traditional food with plenty of options to make your own tasty meals at home. 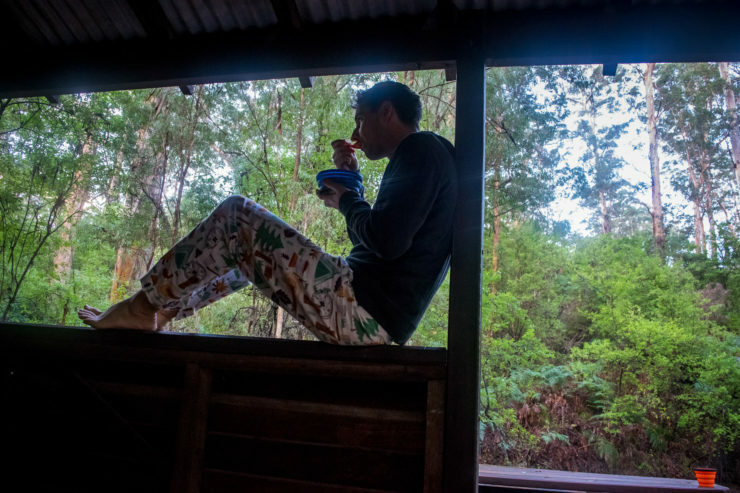 Whatever you eat at home, there is a good chance with a few modifications it can be taken out into the wilderness with you and taste just as good. Here are a few recipes I have modified to be able to enjoy them at camp without having to lug heavy food containers around. The instructions for these recipes are for dehydrating in the oven so you don’t need to go out and purchase a dehydrator. If you already own one then follow the instructions provided with your model. The best way I have heard if a meal is sufficiently dehydrated is that is should look like cat litter and feel very dry. Like most cooking it is done on feel so keep checking until you are happy with the end result. Rehydrating the meals depends on how much weight is in each portion and what you have dehydrated. Generally a good rule is a 1:1 ratio in terms of volume (i.e 1/2 cup of dehydrated meal to 1/2 cup of water). This will not work for every meal so start off with a small quantity of water and add more if required. I let my meals sit for between 15-20 minutes before consuming so they have enough time to rehydrate properly. Kangaroo is a very lean protein so perfect for making dehydrated meals with. This stew adds in a bit of luxury with some red wine and roasted macadamias. Sure to warm the soul after a long day of hiking in the bush. 1) Dice sweet potato into 1x1cm cubes and slice mushrooms finely. 2) Heat up the oil on medium in a large saucepan and fry off the garlic until golden. 3) Add Kangaroo Mince and cook until browned. 4) Add Red Wine, Stock and Vegetables and cook for 20-30 minutes on a medium heat until the stew has reduced a little. 5) Add the Red Lentils and cook for another 20 minutes. Cook for longer if it is still holding liquid. 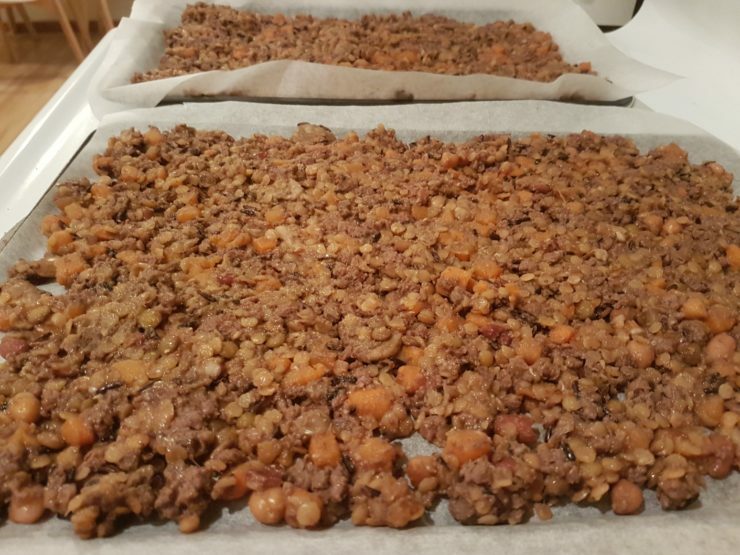 6) Place mixture thinly on baking paper lined trays and place in the oven with the door slightly ajar at a low temperature (60-70C) for 8-10 hours or until mixture is sufficiently dry. 7) Place into zip lock bags or vacuum seal and place into freezer until required. 8) Chop Macadamias and carry separately. Add to stew after it has been rehydrated. A favourite meal of mine at home, it doesn’t take much to adapt it for dehydration. Substitute chicken breast for chicken mince, slice the potato and mango a bit finer and everything is ready to go. Adding the rice mixture to the end lets the flavours soak in and saves you having to use two bowls to rehydrate both the curry and the rice. Enjoy a home cooked curry at camp without the inconvenience of carrying all the ingredients and cooking pots. 1) Cook 1.5 Cups of Rice in a rice cooker or on the stove. This will be added later so keep separate until the end. 2) Dice the Potato into 1x1cm cubes and microwave for 2 minutes on high. 3) Heat up the oil on medium high and add curry paste. Stir for 30 seconds or until fragrant. 4) Add Chicken Mince and cook until brown. 5) Add Coconut Milk, Potatoes, Mango and Fish Sauce and stir until combined. 6) Simmer on medium-low for 20-25 minutes. 7) Add Cooked Rice to the curry and stir until thoroughly mixed. Cook down for longer if still holding liquid. 8) Place mixture thinly on baking paper lined trays and place in the oven with the door slightly ajar at a low temperature (60-70C) for 8-10 hours or until mixture is sufficiently dry. 9) Place into zip lock bags or vacuum seal and place into freezer until required. 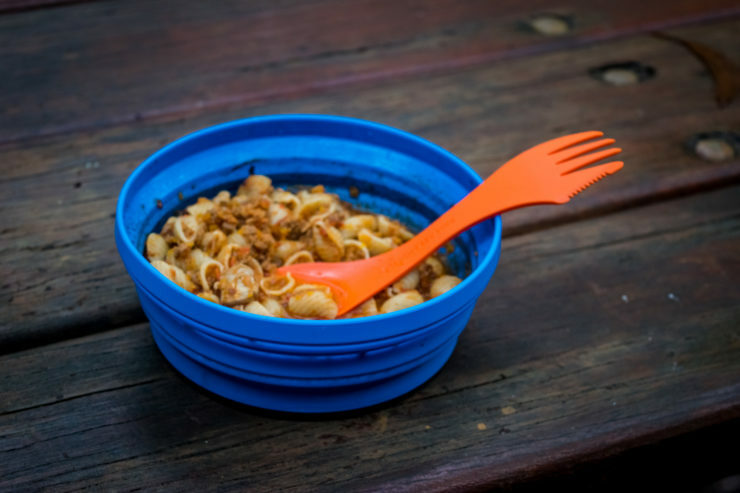 Enjoy the taste of Italy in the forest with this super tasty and easy to prepare pasta dish. Sneaking in a few serves of vegetables by finely processing them adds a lot of flavour and nutrients that you wouldn’t normally get with the off the shelf pasta meals. Nothing beats home cooked Italian and it certainly helps with weary bones at the end of a long day. 1) Cook up Pasta until al dente and set aside until the end. 2) Place Capsicum, Carrot and Celery into a food processor separately and blitz until finely chopped. Slice mushrooms thinly and set aside with chopped vegetables. 3) Heat up the oil on medium in a large saucepan and fry off the garlic until golden. 4) Add Beef Mince and cook until browned. 5) Add Pasta Sauce, vegetables and Basil/Oregano and stir until combined. 6) Simmer on a medium-low heat for 45-60 minutes or until cooked down sufficiently. 7) Add Pasta and mix well. Cook down if still holding liquid. Another curry choice for your travels, this one is a bit milder but still packed with flavour. Turkey is another lean mince that dehydrates well and pairs nicely with the massaman flavours. Chickpeas add a bit of texture and this is always a hit, especially when some roasted cashews are added at the end. 4) Add Turkey Mince and cook until brown. 5) Add the Coconut Milk, Chickpeas and Potatoes. Stir thoroughly. 6) 6) Simmer on medium-low for 20-25 minutes. 10) Chop Cashews and carry separately. Add to curry after it has been rehydrated. 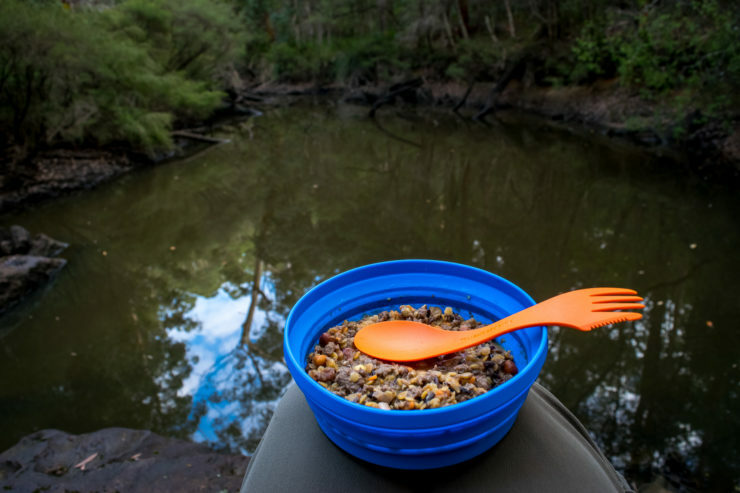 A hiking meal wouldn’t be complete without dessert and this one is as easy as it comes so you don’t have to fuss about in the dark. Warm custard is perfect for those cold nights and the addition of dehydrated fruits gives it an added level of sweetness and taste. 1) Slice Mango, Apple and Strawberries into thin slices and place on a baking paper lined tray. 2) Place mixture thinly on baking paper lined trays and place in the oven with the door slightly ajar at a low temperature (60-70C) for 4-6 hours or until fruit is sufficiently dry. 3) Add boiling water as per the custard packet instructions to the powder and whisk until mixed. Add Condensed Milk or Stevia to desired sweetness. 4) Add the dehydrated fruit and a small amount of extra boiling water. Mix until fruit is covered and set aside for 10 minutes.